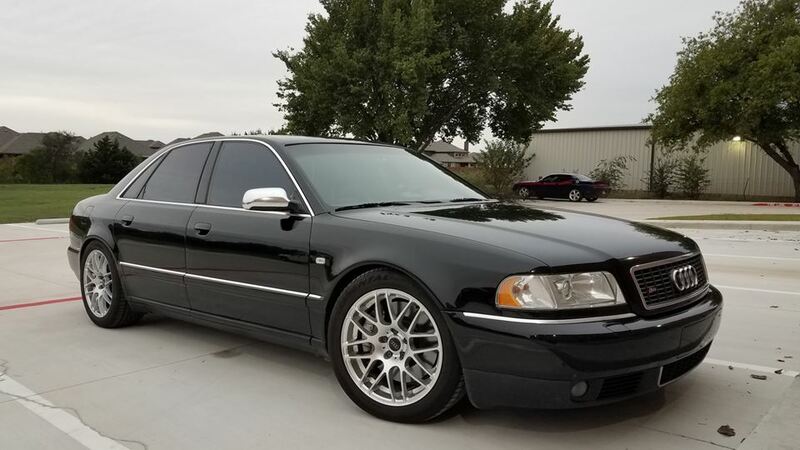 My Audi s8 that needed a LOT of TLC, currently running H&R coilovers, 034 motorsport adjustable control arms, and a full custom mcintosh audio system. I flew to Miami beach to pickup this car, it was quite an interesting trip back to Texas. The previous owner botched the fuel pump replacement and it reeked of gasoline if I opened the windows. Also, the fuel pump wasn't installed properly and the car would "run out of gas" if I was less that 5 gallons low.. so I had to stop every 100 miles or less for a re-fueling. I still made it home and started repairs. I've since rebuilt the entire suspension, brake system, polished and cleaned the paint. Also, had 3m crystaline tint applied. Then I spent an entire weekend integrating mcintosh component sets, a DSP, and all associated wiring into the car. It's been quite the labor of love. A fun video of the S8 in action. A bit long but I hope you enjoy the video. Transmission rebuild, was quite the saga. A full afternoon worth of work and it was worth it.